The Baltimore Ravens open their 12th consecutive training camp at McDaniel College in Westminster, MD on July 30th. Baltimore football has a long history with McDaniel College, as it was also formerly home to the Baltimore Colts training camp. McDaniel College, a private liberal arts college with an enrollment of 1,600 students, is located approximately 30 minutes from the Ravens’ Owings Mills training facility and 50 minutes from downtown Baltimore. From Baltimore via I-695: Take 695 (Baltimore Beltway) to Exit 19 onto I-795 North (Northwest Expressway). Follow signs to Westminster via Route 140 West to Route 31. At light, turn left (Route 31). At first traffic light, turn left onto Main Street and proceed up the hill. The entrance to the Ravens Visitor Parking is on your left- look for signs. All Campus lots are reserved for McDaniel College students and employees; disabled parking is available for Ravens Fans. All visitors to the Ravens’ Training Camp are requested to park around Bair Stadium. Practice schedules are subject to change. Please call 410-261-RAVE (7283) for the most up-to-date practice and fan information. Protect yourself from the sun with sunscreen, sunglasses and a hat. Drinking plenty of water before arriving to practice and continue to keep yourself hydrated throughout the day. During practice, the Ravens concessions offer a variety of beverages for purchase. Bring a camera to capture the moment with some of your favorite Ravens players. Summer storms hit quickly. Bring an umbrella if rain is in the forecast. Autograph seekers should bring a Sharpie (or permanent marker) and memorabilia to be signed by available players. Arrive to the field early to get a seat. While there is plenty of standing room available, covered seating is limited. Pick up a Ravens roster at the information booth in Ravenstown to help you to track your favorite player on the field. 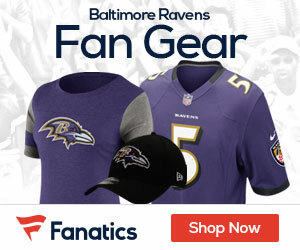 Purchase Ravens apparel and merchandise at the Ravens team store, accepting all major credit cards and cash (no personal checks).